Voting has just opened for the third annual Top Dog Walk competition with the continued backing of Your Dog Magazine and the Kennel Club’s access advisor Stephen Jenkinson, an expert on where dog owners can go and what they can do in the countryside. Dog owners are invited to nominate their favourite walk, for their four-legged friends, from walks all around the South West Coast Path. One lucky voter will receive a complimentary stay at one of Toad Hall Cottages 300 dog friendly cottages to the value of £500. Locals and visitors alike are encouraged to vote for their dog’s favourite walk along this stunning 630-mile National Trail that stretches from Minehead in Somerset to Poole in Dorset. With hundreds of routes to choose from that are dog friendly throughout the year and with recommended places to eat, drink and sleep that are particularly keen on muddy paws, it’s not going to be easy. 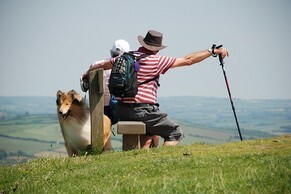 Stephen has worked alongside the South West Coast Path team to advise on dog walking issues. An introductory video showcasing Stephen’s advice for dog walkers on the Coast Path is available here. Knowing you can take your dog with you to a welcoming home from home is really important when choosing where to stay near your favourite walks. If you’ve travelled far with your faithful companion then you want them to enjoy themselves too. Toad Hall Cottages understands that you wouldn’t want to go on holiday without your dog. They have over 300 dog friendly cottages spread throughout the South West, that will accept your furry friends all year round. We'd love to hear about your favourites too so please post us your pictures on our Facebook page or on Twitter @SWCoastPath using the hashtag #TopDogWalk and we'll highlight some of our favourites.